days, truly horrified people all over the world. It all started long before Stoker's famous novel! It is an interesting field of literature thats lets you study the beliefs and superstitions of older times. Don't forget to bring your stake! Article in The Craftsman Magazine. 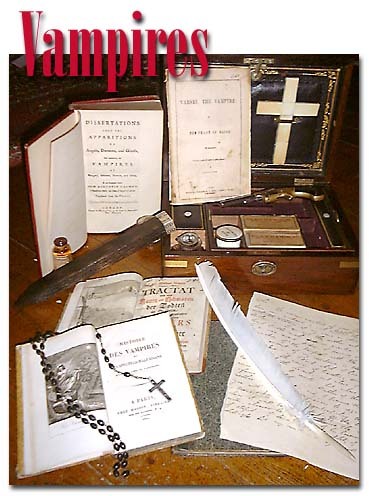 One of the very first english journal reports about Vampires. Vernünftige und christliche Gedancken über die Vampirs. A rare work on vampires. Tractat von dem Kayen und Schmatzen der Todten in Gräbern...Hungarischen Vampyrs Und Blut-Zauger. Michael Ranft. Leipzig 1734. A scarse german tractat on vampires. Dissertations Upon The Apparitions of Angels, Daeamons and Ghosts, and Concerning The Vampires of Hungary, Bohemia, Moravia and Silesia by Dom Augustin Calmet. London 1759. First publication in english of this very important work on Vampires. Collin de Plancy. Paris 1820. A scarce history of Vampires done by the famous and very productive Collin de Plancy. Used by B stoker in his research for Dracula! A scarse little phamplet on Vampires with Blawatsky connections! A classic text on Vampires. The first edition of the first ever written Vampire novel. The anonymos author was J Polidori, physcisian to Lord Byron and together with Byron and Mary Shelley ( Author of Frankenstein), he was present that famous night at Lake Geneva when Frankenstein was conceived by Shelley. Se next entry. A French work inspired by the Polidoris The Vampire. The first edition of one of the most famous novels ever written. The first Vampire play ever. Original Theatre poster London 1821. Early staging of a Vampire Play. The original letter in wich Byron, for the first time, disclaims the authorship of Polidori`s The Vampire. Several European literary magazines declared that the new novel was written by Byron. Only a few remaining in Museum collections. Montague Summers, Kegan Paul (&c), London 1933. The Vampire. His Kith and Kin. the serious student of vampire lore needs both! Montague Summers, University Books, New York 1960 (first published in 1928 by Kegan Paul &c in London). A history of vampires and similar beings, with extensive notes on sources. Montague Summers, University Books, New York, n.d. (this work was first published in 1929 by Kegan Paul &c in London). Our Vampires, Ourselves. Absolutely brilliant study, overview and meditation on vampires in myth, psychology, literature and media. Nina Auerbach, The University of Chicago Press (Chicago and London) 1995. A full description of 1,775 books from 1750 to 1960.
and author, title and motif indexes. Everett F. Bleiler, Kent State University Press 1983. The Vampire in Literature. A critical bibliography. Exactly what the subtitle says it is. Margaret L. Carter, U.M.I. Research Press (Ann Arbor/London) 1989. Not just middle-of-the-road fantasy literature - contains large amounts of info about dark fantasy/horror as well. John Clute and John Grant [editors], Orbit (London) 1997; rev ed. 1999. Bram Stoker. A Bibliography of First Editions. Richard Dalby, Dracula Press (London) 1983. Vampyres. Lord Byron to Count Dracula. Unassuming but wonderful book; contains a succinct history of vampire literature and a fine selection of stories and excerpts from longer works. Christopher Frayling, Faber and Faber (London, Boston) 1991. St. James Guide to Horror, Ghost & Gothic Writers. Thorough overview, containing critical essays (some brilliant, some less impressive) on all writers deemed worthy of an entry. Edited by David Pringle, St. James Press (Detroit, New York, Toronto, London) 1998.